Fast, clean, simple and odourleΒ! The LitterLocker is a disposal bin for used cat litter, with a unique seal system to guarantee total freedom from unpleasant odours. It is hygienic, easy to use, and eliminates those daily trips to the rubbish bin. 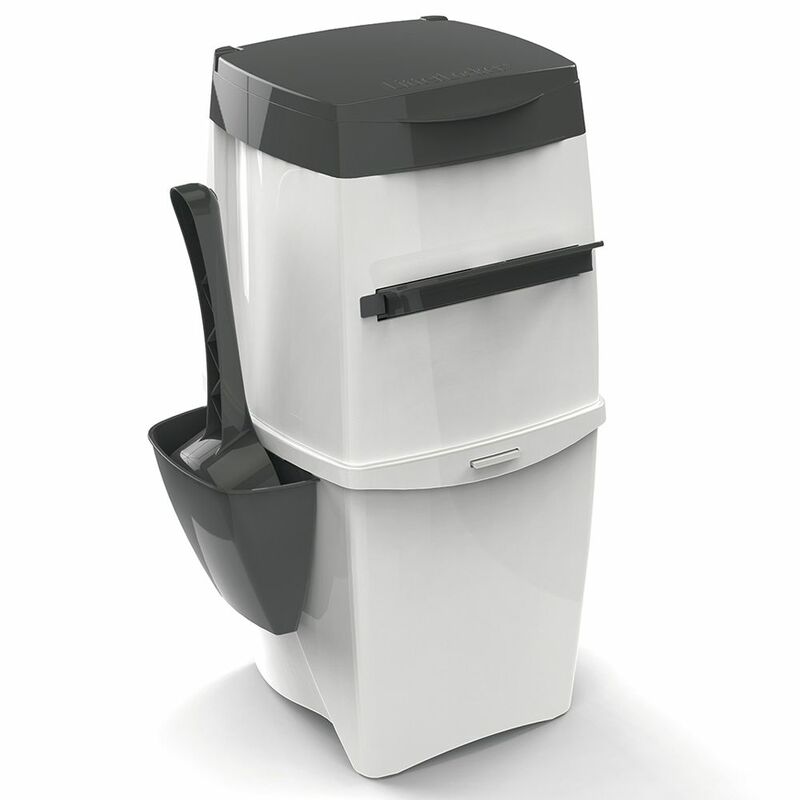 AΒuming you clean out your cat's litter tray once daily, the LitterLocker can hold up to 2 weeks' worth of cat waste. The secret is the film tube: Every Litter Locker II comes with a cartridge containing a special, multi-layered film tube. The airtight film helps lock in unpleasant smells and bacteria. Spares you the daily walk to the bin: AΒuming you clean out your litter tray once daily, the LitterLocker Cat Litter Disposal System can hold up to 2 weeks' worth of soiled cat litter. Once the bag is full, it can be easily disposed of and then replaced with a new bag by pulling more film from the refill cartridge. One cartridge lasts for around 2 months for households with one cat. Easy to use: 1. Open the lid and throw away soiled litter. 2. Close the lid and pull the handle. 3. Release the handle to lock in bad odours and bacteria. Easy to empty: 1. Open the cat litter bin. 2. Cut the film bag. 3. Tie a knot in the bag and dispose. The LitterLocker II Cat Litter Bin at a glance: Innovative cat litter disposal system with a litter scoop and film cartridge Quick, easy and hygienic to use: saves you daily trips to the rubbish bin to dispose of soiled litter With a unique, multi-layered film tube: special AIR-SEAL technology is guaranteed to trap unpleasant odours, germs and bacteria Integrated film refill cartridge lasts for around 2 months for households with one cat Handle closing system ensures the bag remains airtight With litter scoop and removable scoop holder: clean, hygienic and easy to use Integrated childproof knife: for safely cutting the film bag once full Modern design Guarantees hygienic surroundings Easy to use and empty Made in France Colour: white / grey Dimensions: 22 x 23 x 45 cm (L x W x H) The LitterLocker II Refill Cartridge at a glance: Practical cartridge containing a film tube Completely airtight: thanks to the multi-layered film with AIR-SEAL technology Environmentally friendly cartridge: made from 25% recycled materials Traps odours, germs and bacteria Refill lasts for an average of 2 months in households with one cat The film cartridge is easy and hygienic to use: 1. Open the cartridge by removing the plastic strip. 2. Carefully pull out the end of the film. 3. Pull the film through the middle of the cartridge. 4. Knot the end.